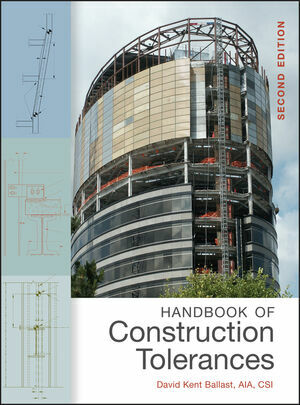 Updating and expanding on its popular first edition, the Handbook of Construction Tolerances, Second Edition remains the only comprehensive reference to the thousands of industry standard tolerances for the manufacture, fabrication, and installation of construction materials and components-- including all-important accumulated dimensional variations. DAVID KENT BALLAST, AIA, CSI, a registered architect, has owned Architectural Research Consulting in Denver since 1981. The consulting firm offers applied research, technical advice, specifications, and information management services to architects, interior designers, and others in the construction industry. Since 1987, Ballast has been an instructor in Interior Construction and Basic Drafting at Arapahoe Community College. He is the author of a number of books on construction technology. Chapter 1. Building Layout and Sitework. 1 1 Horizontal building layout. 1 2 Vertical building layout. 1 6 Grading and sitework. 1 7 Right of way construction. 2 1 Reinforcement placement for flexural members. 2 2 Reinforcement placement in walls and columns. 2 3 Reinforcement placement of prestressing steel. 2 4 Concrete slabs on grade. 2 5 Footings and anchor bolts. 2 7 Cast in place plumb tolerances. 2 8 Cast in place sectional tolerances. 2 9 Cast in place concrete elements in plan . 2 10 Cast in place stairs. 2 11 Glass fiber reinforced concrete panels. 2 12 Architectural precast concrete panels. 2 13 Precast ribbed wall panels. 2 14 Precast insulated wall panels. 2 15 Hollow core slabs. 2 18 Prestressed concrete beams. 2 19 Prestressed single tees. 2 20 Prestressed double tees. 2 22 Prestressed tee joists or keystone joists. 2 23 Precast column erection. 2 24 Precast beam and spandrel erection. 2 25 Precast floor and roof member erection. 2 26 Precast structural wall panel erection. 2 27 Precast architectural wall panel erection. 2 28 Glass fiber reinforced concrete panel erection. 2 29 Autoclaved aerated concrete. 2 30 Tilt up concrete panels. 3 1 Mill tolerances for W and HP shapes. 3 2 Mill tolerances for length of W and HP shapes. 3 3 Mill tolerances for S and M shapes and channels. 3 4 Mill tolerances for structural angles and tees. 3 5 Mill tolerances for pipe and tubing. 3 6 Steel column erection tolerances. 3 7 Location of exterior steel columns in plan. 3 9 Architecturally exposed structural steel. 3 10 Elevator shaft tolerances. 4 1 Concrete unit masonry manufacturing. 4 2 Concrete unit masonry reinforcement placement. 4 3 Concrete unit masonry construction. 4 4 Prefabricated masonry panels. 4 6 Brick wall construction. 4 7 Glazed structural clay facing tile. 4 8 Facing, load bearing, and non load bearing clay tile. 4 9 Terra cotta manufacturing and erection. 4 10 Glass block manufacturing and erection. 5 4 Granite and marble installation. 5 6 Fabrication and installation tolerances for slate. 5 7 Cast stone fabrication and installation. 5 8 Interior stone wall cladding. 6 1 Glued laminated timber fabrication. 6 2 Manufacturing tolerances for structural lumber. 6 6 Rough lumber framing. 6 7 Wood floor framing and subflooring. 6 8 Metal plate connected wood truss fabrication. 6 9 Metal plate connected wood truss erection. 6 10 Prefabricated structural wood. 6 11 Structural insulated panels. Chapter 7. Finish Carpentry and Architectural Woodwork. 7 1 Manufacturing tolerances for board lumber. 7 2 Site built cabinets and countertops. 7 3 Site built stairs and trim. 7 4 Standing and running trim. 7 9 Stile and rail paneling. 7 11 Frames, jambs, and windows. 7 13 Blinds and shutters. 7 14 Architectural flush doors. 7 15 Stile and rail doors?size and flatness. 7 16 Stile and rail doors?joint tightness and flushness. 7 17 Architectural woodwork installation. 8 1 Aluminum curtain wall fabrication. 8 2 Aluminum curtain wall installation. 8 3 Storefront and entrance manufacturing. 9 1 Lightgage framing for gypsum wallboard. 9 2 Wallboard partitions, ceilings, and trim. 9 3 Glass reinforced gypsum products. 9 4 Installation of lath and plaster. 9 5 Floor and wall tile. 9 9 Acoustical ceiling installation. 9 10 Linear metal ceiling installation. 9 11 Stainless steel ornamental metal products. 9 12 Copper alloy ornamental metal products. 9 13 Extruded aluminum tubes. 9 14 Aluminum rods, bars, and shapes. 10 1 Manufacturing tolerances for flat glass. 10 2 Manufacturing tolerances for patterned and wired glass. 10 3 Tempered, heat strengthened, spandrel glass, and bent glass. 10 4 Sealed insulated glass units. 10 5 All glass entrances. 10 6 Decorative architectural flat glass. 10 7 Laminated architectural flat glass. Chapter 11. Doors and Windows. 11 1 Standard steel doors and frames. 11 2 Insulated steel door systems. 11 3 Detention security hollow metal doors and frames. 11 4 Standard flush wood doors . 11 5 Standard stile and rail doors. 11 6 Wood swinging patio doors. 11 7 Installation of wood doors. 11 9 Aluminum windows and sliding doors. PART 2. ACCOMMODATING CONSTRUCTION TOLERANCES. Guidelines for accommodating construction tolerances. Chapter 12. Cast in Place Concrete Systems. 12 1 Concrete frame tolerances. 12 3 Detailing for cast in place and precast systems. 12 4 Detailing brick on cast in place concrete. 12 5 Detailing for stone on concrete. 12 6 Detailing for curtain walls on concrete frames. 12 7 Detailing doors in cast in place concrete. 12 8 Detailing windows in cast in place concrete. Chapter 13. Precast Concrete Systems. 13 1 Combined precast concrete frame tolerances. 13 3 Detailing for precast systems. 13 4 Detailing for precast and steel systems. 13 5 Detailing masonry and precast systems. 13 6 Detailing doors in precast concrete. 13 7 Detailing windows in precast concrete. Chapter 14. Steel Frame Systems. 14 1 Accumulated column tolerances. 14 2 Accumulated steel frame tolerances. 14 3 Detailing for steel structural system tolerances. 14 4 Detailing for precast on steel. 14 5 Detailing for brick on steel . 14 6 Detailing for stone on steel systems. 14 7 Detailing for curtain walls on steel frames. 15 1 Masonry joint tolerance. 15 2 Detailing brick and masonry systems. 15 3 Detailing for stone on masonry backup. 15 4 Detailing interior stone on masonry. 15 5 Detailing doors in masonry. 15 6 Detailing windows in masonry. Chapter 16. Timber and Carpentry Construction. 16 1 Detailing wood joints. 16 2 Detailing for timber columns. 16 3 Detailing for timber beams. 16 4 Detailing for prefabricated structural wood. 16 5 Detailing for paneling and site built substrates. 16 6 Detailing for cabinetry and site built substrates. PART 3. MEASURING COMPLIANCE AND DOCUMENTING CONSTRUCTION TOLERANCES. Chapter 17. Methods of Measurement. 17 5 Measuring flatness, level, and smoothness. Chapter 18. The Uncertainty of Measurement in Construction. 18 1 The expression of measurement. 18 3 Units of measure. 18 4 Significant figures and rounding . Chapter 19. Documenting and Enforcing Tolerances. 19 1 Documenting tolerances on drawings. 19 2 Documenting tolerances in specifications. 19 4 Tolerances and accessibility.